Table top train sets were the answer to the larger gauge railway layouts. When space was hard to find, a table top layout was the answer. It was Frank Hornby who first produced a viable and economic system, which he christened Hornby Dublo. Introduced in 1938, Hornby Dublo ran on a three rail system, which meant that the electric current ran through the middle or third rail. The locomotives had diecast bodies and the rolling stock was made from tinplate. Later in the 1960s, the firm was taken over by Tri-ang and plastic locomotives and rolling stock were introduced. 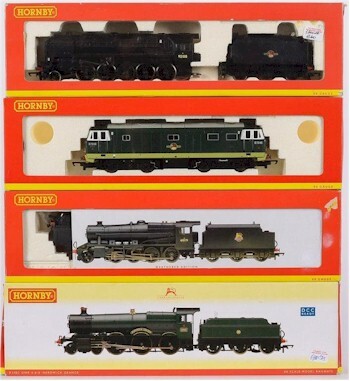 Various boxed 00 gauge model locomotives (SC20/1128): A Hornby GWR 4-6-0 6800 Grange Class locomotive 'Hardwick Castle'; A British Railways 2-8-0 Class 8F locomotive 'Weathered'; a British Railways 2-10-0 Class 9F locomotive; and a British Railways Diesel 'D7046'. Continental toymakers also followed Hornby into OO/HO gauge railways: Marklin, Fleischmann, Rivarossi, Jouef and Lima to name a few. Whilst some of the continental makers arguably produced better models, most produced locomotives and rolling stock of their own country. Only a few British style locomotives were produced by the foreign makers. Equally continental railways were not as popular in this country and rarely modelled. However, the quality of the locomotives (especially by the German manufacturers) makes them highly sort after. Always a popular gauge with modellers and collectors alike, the OO/HO Gauge Railway Models are popular in our Collectors Sales. A Hornby Dublo No 3235 three-rail 4-6-2 locomotive No 34042 'Dorchester' in British Railways green livery with six wheel tender, boxed together with instruction leaflet (SC20/1150).